German students enjoy an all-American lunch at the Dining Facility in Hohenfels. 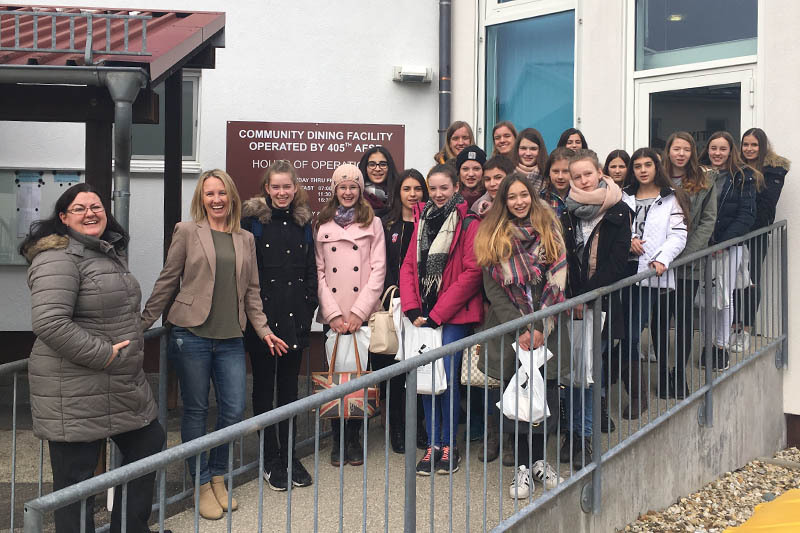 Twenty-two students from Neumarkt Staatliche Realschule Fuer Maedchen, an all-girls school in Neumarkt, visited the library and other on-post facilities at USAG Bavaria Hohenfels. HOHENFELS, Germany — Twenty-two students from an all-girl German school took a trip to America last week — and it only took forty minutes to get there. No, they weren’t on an extremely fast plane or in a super-secret military time machine, they visited USAG Bavaria Hohenfels. These young ladies, all students at Neumarkt Staatliche Realschule fuer Maedchen, were greeted by the Hohenfels School Liaison Officer. After a brief bus tour of the installation, the young school girls stopped at the Hohenfels Turnbull Memorial Library. Nancy Barker, the post librarian, provided a library orientation and a quick introduction to the Dewey Decimal System. The library scavenger hunt was the main event. Students scanned QR codes with their smartphones and were tasked to find something by using the library catalog, asking a librarian or reading a book. This scavenger hunt allowed them to practice their English skills and develop cultural awareness of American libraries. While at the library, the students watched librarians host their weekly story time program for two to five year-olds. The students participated in the story time and were able to see what makes US libraries unique: fun library programing. One student was really impressed by the library’s programs — particularly Blind Date with a Book and the weekly Story Time for children. “Everything is catered to inviting people to come in and stay a while,” she said. “The library was such a welcoming, warm place — with the puzzles and the fire place,” another student added. Also, no trip to the Hohenfels library is complete without licks from Lilly the Library Therapy Dog. The group enjoyed the “American Soldier Style” at the Dining Facility, or DFAC, for lunch. Their eyes widened seeing all the yummy food choices. As typical teenagers, most of the students forwent the fish and pepper steak and, instead, went straight for the chicken nuggets, french fries, onion rings and grilled cheese sandwiches. “This is just like at a hotel when my family is on holiday,” a student said, peering over the large salad bar. “Americans even have a chocolate fountain machine,” another said. Partaking in the DFAC experience and seeing all the options offered to Soldiers on a daily-basis was an adventure. “The food in the cafeteria looked so American, just like in all the movies,” a student said. Their minds full of knowledge and bellies full of American cuisine, the school girls loaded up on the bus and left their American vacation behind to return to their school in Neumarkt. Who knew a Bavarian trip to America was so convenient.